Amidst the deluge of advice for businesspeople, there lies an overlooked tool, a key to thriving in today's fast-paced, unpredictable environment: improvisation. 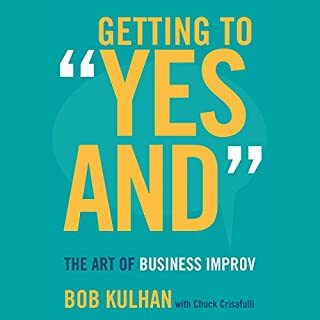 In Getting to "Yes And" veteran improv performer, university professor, CEO, and consultant Bob Kulhan unpacks a form of mental agility with powers far beyond the entertainment value of comedy troupes. In an irresistible invitation to lighten up, look around, and live an unscripted life, a Stanford University professor and master of the art of improvisation explains how to adopt the attitudes and techniques used by generations of musicians and actors. These secrets are currently being taught to entrepreneurs, engineers, and first responders in a crisis as well as housewives and Alzheimer caregivers. Let's face it: Life is something we all make up as we go along. In this step-by-step guide, an actor and improvisational teacher brings his tested methods to the page to show how actors can take risks and gain spontaneity in all genres of scripted theater. Through 28 lessons - each of which includes warm-ups, points of concentration, and improvisation exercises - Improv for Actors provides insights into thinking and reacting with fluidity, exploring a character’s social status, using the voice and body as effective tools of storytelling, and more. At the height of the McCarthy era, an experimental theater troupe set up shop in a bar near the University of Chicago. Via word-of-mouth, astonished crowds packed the ad-hoc venue to see its unscripted, interactive, consciousness-raising style. From this unlikely seed grew the Second City, the massively influential comedy theater troupe, and its offshoots - the Groundlings, Upright Citizens Brigade, SNL, and a slew of others. 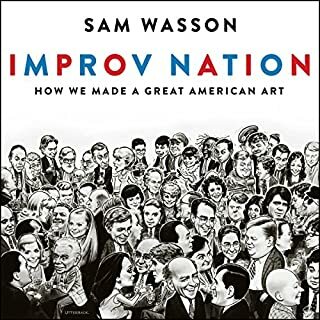 Sam Wasson charts the meteoric rise of improv in this richly reported, scene-driven narrative. Relax, We’re All Just Making This Stuff Up! The tools improvisers use to create wonderful - and often hilarious - scenes on stage are easily transferred off the stage and into real life. These tools have changed my life completely, and I want to share that with you. 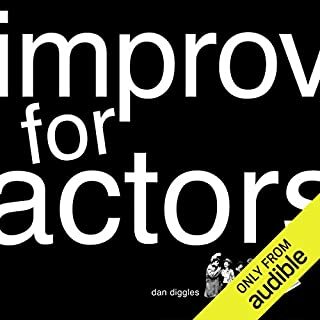 In this audiobook, you’ll find some of our favorite improv exercises as well as real-life examples of how our students’ mind-sets and lives have grown and become ultimately fulfilling through practicing improvisation. What if a company did everything in its power to create a culture in which everyone could overcome their own internal barriers to change and use errors and vulnerabilities as prime opportunities for personal and company growth? Robert Kegan and Lisa Laskow Lahey have found and studied such companies - deliberately developmental organizations. A DDO is organized around the conviction that organizations will best prosper when they are more deeply aligned with people's strongest motive, which is to grow. Why is the Mona Lisa the most famous painting in the world? Why did Facebook succeed when other social networking sites failed? Did the surge in Iraq really lead to less violence? How much can CEO’s impact the performance of their companies? And does higher pay incentivize people to work hard? If you think the answers to these questions are a matter of common sense, think again. After Steve Jobs was unceremoniously dismissed from Apple, he turned his attention to a little-known graphics art company that he owned called Pixar. One day, out of the blue, Jobs called Lawrence Levy, a Harvard-trained lawyer and Silicon Valley executive to whom he had never spoken before, in the hope of persuading Levy to help him get Pixar on the right track. What Levy found in Pixar was a company on the verge of failure. To Pixar and Beyond is the extraordinary story of what happened next. So many of us go through life following scripts we didn’t write for ourselves - scripts designed by our family, shaped by our friends, and influenced by the expectations of the people we meet. Using practical self-help skills rooted in improv principles and depth psychology, we can live more authentic, fulfilled, and empowered lives. You think you have a winning strategy. But do you? Executives are bombarded with best-selling ideas and best practices for achieving competitive advantage, but many of these ideas and practices contradict each other. Should you aim to be big or fast? Should you create a blue ocean, be adaptive, play to win - or forget about a sustainable competitive advantage altogether? After meeting chef Alice Waters at her legendary restaurant, Chez Panisse, Sydney Finkelstein got to thinking about the dozens of chefs who had come from her establishment to open their own restaurants and gain notoriety as some of the country's most creative culinary figures. Waters, he found, had spawned a family tree of geniuses. Could this pattern exist in other industries? There is a paradox. As children, most of us think we are highly creative; as adults many of us think we are not. What changes as children grow up? Organizations across the globe are competing in a world that is changing faster than ever. They say they need people who can think creatively, who are flexible and quick to adapt. When Freakonomics was initially published, the authors started a blog - and they've kept it up. The writing is more casual, more personal, even more outlandish than in their books. this book is free on the blog and podcast. America is an urban nation. More than two thirds of us live on the three percent of land that contains our cities. Yet cities get a bad rap: they're dirty, poor, unhealthy, crime ridden, expensive, environmentally unfriendly. Or are they? As Edward Glaeser proves in this myth-shattering book, cities are actually the healthiest, greenest, and richest (in cultural and economic terms) places to live. Learn how to master Agile software development practices. This book teaches you how you can adopt Agile development practices into your organization the right way. Coauthors of the international best-seller Difficult Conversations, Stone and Heen have spent the last 10 years working with businesses, nonprofits, governments, and families to determine what helps us learn and what gets in our way. With humor and clarity, they blend the latest insights from neuroscience and psychology with practical, hard-headed advice. 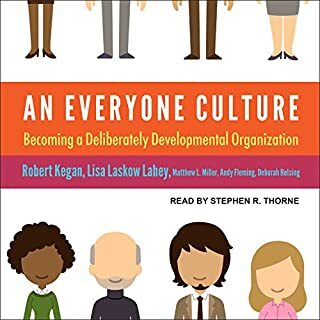 This audiobook is destined to become a classic in the world of leadership, organizational behavior, and education. The Second City has launched the careers of celebrated comic performers such as Tina Fey and Stephen Colbert and produced award-winning content. But it's the actual improvisational process developed and honed over the years by The Second City that has become its legacy. Players master an ability to cocreate in ensembles using philosophies that celebrate a "yes, and" approach. They embrace authenticity and failure and espouse the idea of "following the follower", which allows any member of the team to assume a leadership role. Would you try another book from Kelly Leonard and Tom Yorton and/or Alan Winter? No. It never seems to get to any points advertised. Very disorganized presentation. What three words best describe Alan Winter’s performance? Disappointment. I wanted something useful. I'm not going to hire Second City to come to my meeting and make a point using sketch comedy. I thought the book would would focus on "showing leaders how to apply the tools of improv to common business challenges", as described. Instead, this was a rambling pile of name-dropping. The book meanders through business-type situations (without getting to the meat of what was done) and quickly returns to theatre performances - even describing the number of people in the audience, and whether they were grumpy. I bought this book to learn about improvisation. All I got from it was that Second City has a department that works with businesses to teach improvisation skills. This book is basically an infomercial so that more businesses will hire them. 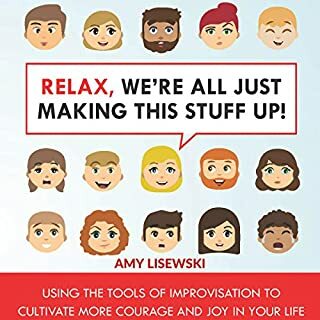 This book does so many different situations in which improvisation works to help the situation, but doesn't explain how to improve improvisation skills. It's as if you were in a math class and the teacher kept saying "use the quadratic formula! Use the quadratic formula! Use the quadratic formula," without ever putting the quadratic formula on the board of explaining how it works. I have never been more disappointed in an audible purchase. To add insult to injury the narrator kept breathing in the middle of the sentences because he couldn't finish the thought of the page. That was super annoying. This is More about marketing second city works - so - I do not recommend this book. This book was one of the biggest disappointments I've had in an Audible book this year. It could have been partly that my expectations were too high. As others have said, the title is as much as you will learn about improvisation. There is very little about the practical application of the "yes, and" philosophy. This book is basically a really long brochure for Second City. If any writers want to satisfy some readers, they could write a book describing how to use the "yes, and" philosophy for improvement on and off the stage. Required reading for creation in teams. This is a simple concept, driven home in an intelligent and entertaining way. I work in a creative business and the &quot;Yes, And&quot; philosophy is critical to doing good work. I have injected it into our process. Opened my mind to how corporate America can gain from this. Worth the read or in this case THE LISTEN! I knew the book was going to give practical advice for bringing improv methods into business but I was hoping for more laughs too. This was a very long infomercial with detailed description of all the good programs you can buy from Second City Works and didn't provide real advice on leading improv exercises without their help. I am a huge fan of Second City and many of the wonderful alumni. I don't feel any more informed about its inner workings but was occasionally entertained. The best I can say is that performance of surprisingly dry material was good. Devoured the learnings from this book! 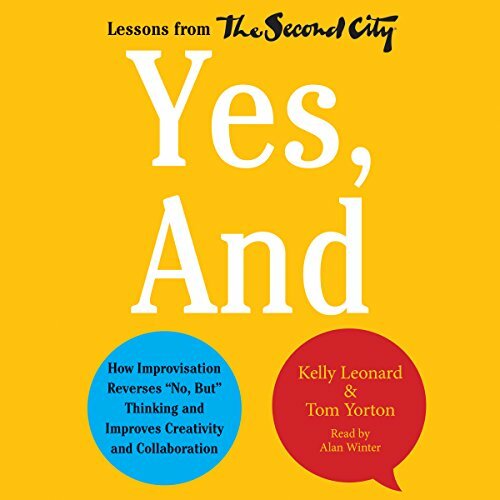 What a great read about the journey of Second City and how to them, Improv is not just fun and games but a serious tool for bringing about deep transformations among individuals, businesses and corporations. The narrator's voice I felt, was ideal for this genre of books and really added to the value of listening to this audio book. Can't wait to listen to the book again! 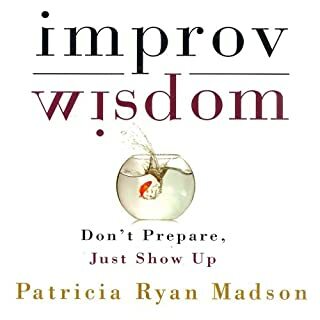 Great insights into how elements of improv can help in work and life. important for employees and managers alike to read.